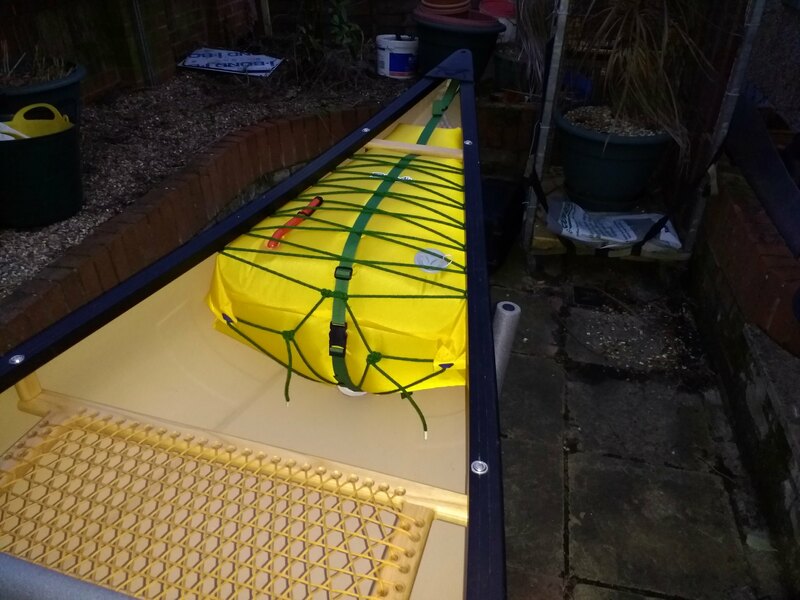 I've bought a kevlar prospector 15.6ft canoe (kevlar and carbon inside, fibreglass outside, and gelcoat). 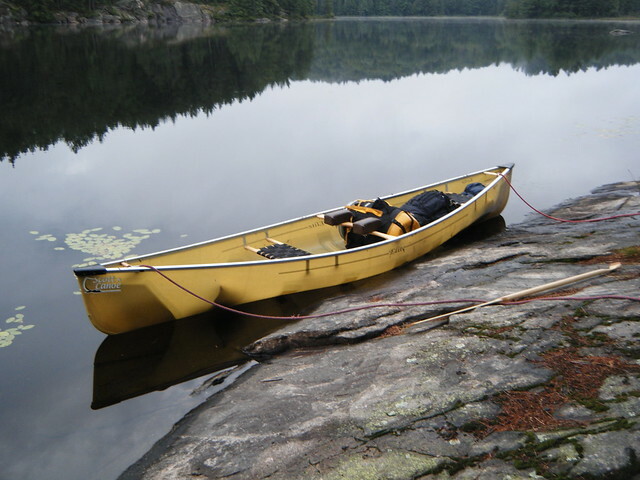 I'm planning to use it on flat water, quiet rivers and and some gentle expeditions. It has ash gunwales. I'd love some advice on outfitting! I want to fit flotation wedges. Would you drill the (very thin) hull or attach clips to the underside of the gunwales? Would you add end loops? Would you lace the whole length? I don't want to go over the top but I'd like to ensure it's buoyant. I'd also like some anchor points for luggage: should I lace or bond in D-loops? Not sure it makes much difference but it will be dry(ish) stored in my garage. To be honest, for your use, I personally probably wouldn't bother outfitting it with flotation - does it have small "tanks" built in, enough to stop it sinking? If I did, P-clips under the gunwhales might be nicer, and could also work for attaching gear loops, or simply attach metal fittings under the gunwhales. I'm not sure what the current advice on drilling thin composite hulls is, and would also worry about the edges cutting through the rope loops. Which make it is? Sounds lovely. It doesn't have flotation built in, other than the wooden gunwales! We're testing it in a swimming pool this weekend. It's unbranded: got it on ebay and it's a one-off. Seems well-made though: the guy I bought it from is a composite specialist. Hull looks really good and I think it's a very long term keeper. I know that some advise against flotation wedges because they can give a false sense of security, but I'm planning to be sensible in it and prepare for the worst. I don't aim to capsize it but I don't aim to lose it either! I'm happier with them fitted, my young daughter wil be sharing it with me. Why would anyone put fibreglass over kevlar/carbon?? I sort-of understand the gel coat (although I wouldn't put it on my own kevlar boat coz it weighs too much), but I don't get that whole lay-up at all. 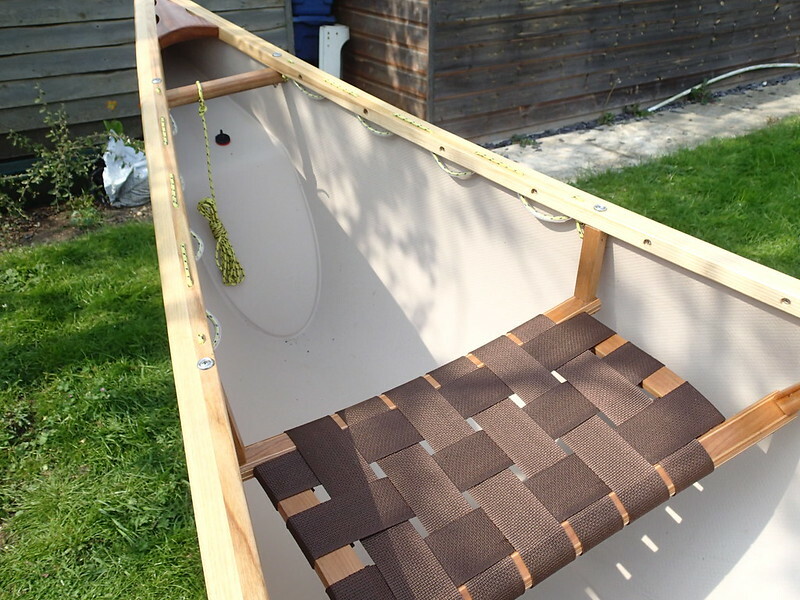 Mine has built-in flotation (as does every canoe over 'ere), so maybe you need to put something in it for that, but for your uses, you really don't need to tie anything down. Really, you don't. Why would anyone put fibreglass over kevlar/carbon?I sort-of understand the gel coat (although I wouldn't put it on my own kevlar boat coz it weighs too much), but I don't get that whole lay-up at all. Good question, and I asked it myself. Apparently the chopped fibreglass outer layer and gelcoat are easy to repair, add impact resistance and give a sharp, crisp finish. The inner kevlar/carbon is for strength and rigidity. I guess it would be lighter without the glass fibre, but it's quite a common layup. The kevlar/carbon was laid up with vinylester and vacuum bagged (no 16ft long autoclave available!). It's 26kg, so I can put it on my car on my own. This was a critical need for me! Last edited by waylandsmithy; 7th-February-2019 at 06:24 AM. I think Souris also do glass + kevlar layups. Unbranded, a one-off by a composite specialist. Have you got a picture of the boat ? I did mine like this, would certainly check if it floats without chambers. As Mal says, if it does I wouldn't bother with extra flotation. I can see why you'd want wedges, if it has no built in buoyancy. You don't want it to go to the bottom of the lake. My initial reaction was that clips under the gunwales won't be string enough, but thinking about the forces on the buoyancy fixings: your description of use suggests generally calm waters, so the most likely scenario where you'd need them (not necessarily likely to happen) is that you've capsized, boat part full of water, then you've climbed back in but not yet bailed out the water. So the boat is floating, and most of the weight of water is supported. The wedges are holding (above the water) most of the weight of the boat itself, you and your daughter. 26kg for the boat, say half of that is immersed and floating. Say 100kg for paddlers, mostly above water level, maybe 10kg of buoyancy. So just over 50kg of possible uplift per wedge. If you put 5 fixings each side, that 10kg per fixing. Which doesn't sound too bad. However, unless the blocks are deep enough to reach right up to the gunwales, clips aren't really going to be in the right place. In that case I'd look at bonding to the hull. What I'd do (but I've done a bit of this kind of thing) is get some webbing, maybe 1cm wide and quite thin and not tightly woven, and make horseshoe shaped loops. Sand the surface of the hull thoroughly (with gloves & mask) in patches about 8cm square, and fix the horseshoes with adhesive tape so that the tails overlap about 5cm onto the sanded patches. Then brush West 105 Epoxy over and under the tails, and over the sanded are, place a square of fibreglass mat over than and stipple it down. For a smooth finish stipple a 10cm square of peelply over that (when it's set, you rip off the peelply and it leaves a smooth surface without bits of fibre sticking up). Maybe 3 loops each side, about 5cm below the top of the wedge? I wouldn't fit end loops unless you think the boat might get stuck on a rock and have to be dragged off, or if you might have to lower it down a bank to launch. I assume it already has handles you can tie a painter to? I'm going to add flotation to my TuffStuff NC Pal. The built-in tanks keep the hull from disappearing into the depths, but that's about it. The lay-up at the gunwales is so thin that I wouldn't risk drilling it so I'm going to use p-clips riveted to the underside of the ally gunwales. Also going to loose the wanky little eyebolts. I've had a good feel about and because of the layers where the tanks are fitted, I think there's enough thickness to drill for end loops. If, once I've drilled, I think things need beefing up, I'll epoxy some biax cloth inside. Mat at BPM is making some airbags that are truncated to allow for the in-built tanks. I do plan to tie painters to the handles. Hmm, bonding or p-clips? That's another idea in the mix! There is enough thickness to drill for end loops and it's relatively easy to do because the deck plates are easily removed. If you use skin fittings similar to the ones Chainsaw used, they help beef up the area where you've drilled. On a previous boat, I used a short piece of thick walled plastic pipe inside the boat to fit the skin fittings into and glued them in place using the pipe weld glue that plumbers use. That made a nice strong job and also prevents any seepage of water into the boat. As for the eyebolts, whilst I don't use them, I left them in place for a little protection when ramming into something or when standing the boat on its end. if you ever do . I beleive it is quite common for kevlar, carbon and carbon/kevlar boats to have a lightweight layer of finely woven glass cloth against the gel coat to prevent a print through effect where the gel shrinks a little on curing and can show and even slighly adopt the texture of the much heavier kevlar, carbon or hybrid cloth. I can understand using glass tissue or similar for this. Not really heard of anyone using a full layer of chopped strand mat for it before though, that does seem a bit unusual, but backed up with the stiffness of carbon and high tensile strength of kevlar maybe it does help to limit puncture damage - randomly oriented chopped strand mat tends to develop a small hole, woven fabric reinforcement can often split for several cms along the weft or weave from the impact site. 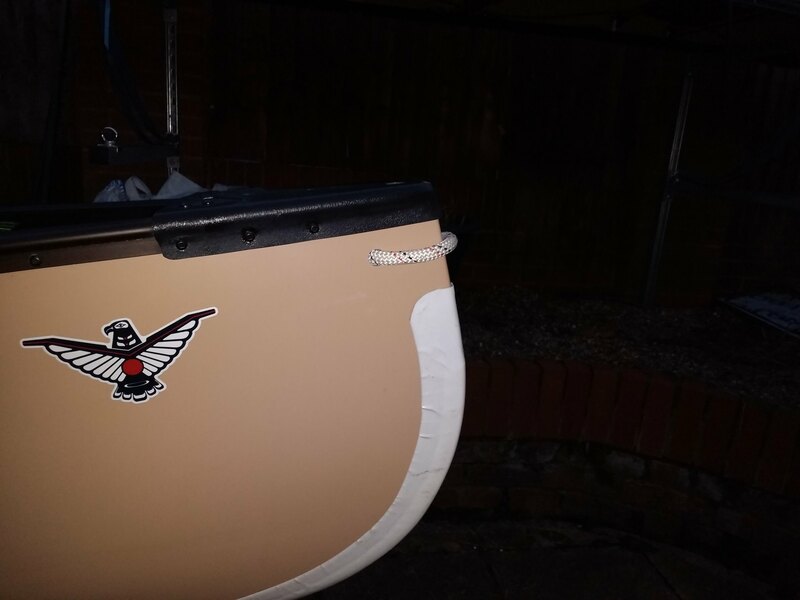 We certainly used to use a light glass cloth on racing dinghies when I used to build them, and I have noticed it on slalom boats I have repaired. As for the outfitting, my question would be why buy a nice lightly constructed boat and then add a load of extra weight in lacing and stuff? That stuff makes sense if you are running white water loaded up for long camping trips, and indeed my slightly heavier fibreglass canoe is set up this way, but for flat water and easy rivers it is unnecessary. You will need some buoyancy to prevent it sinking, but not a lot. There are lots of views on buoyancy and how much to have, but if you are mainly a fair weather flat water paddler, your best bet will be to fit the smallest air bags you can find in the ends as much out of the way as possible. They will still likely provide more buoyancy than other manufacturers buoyancy tanks. How to fit them - I would stay away from doing anything to the Ash gunwales, they are an important piece of structure, are probably quite small and already have lots of holes in for the screws that hold them onto the boat. My boat came with holes drilled through the gunwales for lacing, they failed fairly soon after I got it, through rot rather than because the holes weakened it, but the rot was caused by the holes, and if they hadn't rotted there would have been a risk of failing due to the holes anyway. P-clips need to be screwed to the gunwales, I would avoid that. Drilling the hull very close below the gunwale does work well, and I would have no hesitation doing this unless the boat is really lightweight construction, but only do it where the air bags are going to be. Chris B's suggestions for fitting anchors are probably what I would do in your case - bear in mind that even if you lace the sides you will need an anchor on the centreline at the end of the bag to stop it just sliding back into the canoe out of the lacing, so you will have to make a couple of these anyway! Last time I did this with webbing I tried to fray/tease out the ends where they were to be glued down, it didn't really work so I basically cut strips about 5 cm in from each end so I could spread them out and make sire the resin had penetrated into them well. You can use rope/cord instead of webbing in which case fraying the ends is quite important - it is how the strap anchors are fitted to many slalom and WWR canoes! If you are already quite proficient at laminating it would actually be fairly trivial to make some buoyancy tanks. For carrying luggage, most of the time you are best off just making a rope leash and tying it to a thwart, I would only spend time lashing it down tightly for rough water where if it shifts it would cause me problems. Some of our NA friends here would say just make sure everything will float and carry it all loose - you can always paddle around and collect it all if you are paddling flat water and easy rivers... Just think about where you will actually be paddling and what the likely scenarios are. Thanks for all the advice! I'm leaning towards adding lacing just for the wedges, and securing the wedges to the bottom with either bonded-in leashes or pads with D-rings. It's definitely not a canoe that I want to try white water in, I'm sure I can have plenty of fun on the calmer stuff...I don't think I'm going to add end loops, after reading this thread. Assuming the carbon tape is on top of kevlar, you have a bit of extra thickness at the gunwales already, also looks like there is a layer of glass cloth on the inside of everthing else, and are there patches of foam core in the bottom or is it just an optical illusion caused by the carbon tape? Defintely don't drill through anywhere with a foam core, thats a recipe for water ingress and subsequent delamination - I have just part re-cored the hull of a slalom K1 which had been split externally and the seat had worn through the inner skin and no-one had realised and continued using it - it was delaminating from the core on both sides! No, the patches aren't for buoyancy: the builder added carbon patches to stop oil canning as it was pretty flexible when it was initially made. It certainly seems pretty stiff now! The colour inside is from using orange carbon, the black bands are kevlar (I think). The walls are very thin, but suprisingly stiff. It's definitely quite light, but the guy is looking to build a lighter one next. I can pick this up fairly easily, which is what appealed to me: if I can't get it on my car, I can't go out paddling! Foam core is not for bouyancy, it is for stiffness (to prevent oil canning). By separating inner and outer skins with lightweight foam you get almost the same stiffness as you would get from a solid laminate with the same overall thickness, but at a fraction of the weight. At first glance I thought maye there were 4 rectangles where a foam core had been added between bands of carbon tape, but it could also be that it is a sheet of carbon with "patches" on top. The patches might be foam core with a layer of kevlar cloth over, or might be coremat or similar. Naturally carbon is black and kevlar is yellow (appears more orange with some resin systems), I have seen coloured carbon, but not coloured kevlar. Also Carbon is stiff and most expensive, Kevlar is strong in tension, you would stiffen a kevlar hull with bands of carbon rather than the other way around. There is no doubt in my mind that your builder has added carbon longitudinally in the keel and sheerstrake to improve the hull girder stiffness, and then added more carbon, possibly bands or a sheet in the bottom to stiffen it, and also added some extra thickness whether foam core, coremat or other method in "patches" to also stiffen the bottom. That is the sensible way to go about it. The patches may have orange dyed carbon over them, or just kevlar. The reason I thought it might have a final layer of glass cloth is that in the last photo you can see a textile pattern that appears to continue from the carbon band to the adjacent kevlar, suggesting there is another layer of cloth over the top of everything (glass becomes clear when wet out with resin), but of course I have overlooked that it was vacuum bagged - I am actually looking at the texture left by the peel ply that is used to separate the wet laminate from the breather cloth and vaccum bag. I should have known that, all my repairs have that same texture! I can't see the pictures (and I am logged in to my Google account - I've heard Google addresses can change and there's a right and a wrong way to link them). Black bands are usually carbon; kevlar is golden when new and turns brown with UV. Thinking again about the wedges, I would consider getting smaller ones than are sold for white water use. 50cm from each end would be plenty to avoid sinking, and you'll have more space, particularly leg room in front of the front seat. ...... It's 26kg, so I can put it on my car on my own. This was a critical need for me! 26 kg would be way too heavy for me nowadays (72-year-old pensioner-lady... ) I do a lot of carries in the backcountry (coz I live and wander in Shield country...).... mine is 17 kg - which is why no gel-coat, just clear-coat on the outside - and that's heavy enough for me now. Definitely wanted something stronger than p clips but discreet enough not to spoil appearance especially on the Merlin.
. I'm planning to use it on flat water, quiet rivers and and some gentle expeditions. It has ash gunwales. I'd love some advice on outfitting! Don't bother. Its probably already buoyant and if your only going on flattish water why bother. Even a capsize normally leaves the boat only partially swamped. I certainly wouldn't bother with anchor points for luggage. You already have them - the seats and thwarts are widely used in Canada on both flat and white water for tying your kit in. And of course kit, in waterproof bags./barrels etc., adds a huge amount of bouyancy. Well, we tested it at the swimming pool today, and it definitely sinks! I'll add wedges and tie them in with p-clips. I won't lace it: I can't quite bring myself to drill holes in such thin material anyway! Yep, definitely sinks, you were right to want to add something! Full marks for rolling it though! That was Potty Paddler, not me!! Great to finally get on some water with it. One of the joys of outfitting a composite boat is the ease with which things can be glued to the shell, can't think of a reason to drill holes in it. Would you just use an ordinary epoxy adhesive such as araldite? Epoxy is usually good - araldite (there are a few different ones) should do - but I usually have west or similar on hand which when mixed with a suitable thickener does the job. Back when polyester resins were in common use - this made an effective glue on glass-fibre boats. Cross posted with Jim - who as usual does a fine job of covering the options. Last edited by DougR; 17th-February-2019 at 07:48 PM. Going back to one of the original question of this thread re. possible ways to lace a composite canoe. When I bought the Swift Prospector 17 I didn't want to lace the whole length so ended up just doing the ends to allow small items to be attached. I didn't like the idea of p-clips under the gunwales but wanted something a little stronger so I went with this solution. Drilled gunwales with the rope laced through them with pipe loops on the underside. That looks neat Rob, have you done anything special in waterproofing/lining the drilled holes through your inwales. I might be slightly worried about the hose loops retaining moisture and the lacing wicking it into your lovely woodwork. I've algae growing in the tubing and lacing of my Mad River Explorer 16TT but I'm reasonably sure that the laced plastic hull won't rot. The lacing has been on there for 5 years now and as far as I can tell not caused any problems with mold. I did fill the holes with linseed oil before lacing though. I am more concerned about the gunwales where the paddles touch, this canoe has done 5 big family Pirate adventures as well as multiple others racking up many miles and the wood requires a bit of TLC. Brill ... my paddleshafts seem to be softer than my gunwales, I made a right mess of one on a circular route a couple of years back, I then kevlar wrapped it and am slowly working my way back down through the kevlar ... I've been told that a glass wrap might have been better as it'd wear smooth rather than slightly fuzzy, so that will be it's next wrap. Neat job Colin. Do we need to head for Gresham Mill again to test it? Do we need to head for Gresham Mill again to test it?